A key part of delving into technical analysis and trading off of charts, trendlines make an excellent tool for traders—if they're used correctly. Used improperly though, they become ineffective and even counterproductive, resulting in a belief that prices have made a reversal when they really haven't, or that a trend has strength when price action suggests it doesn't. 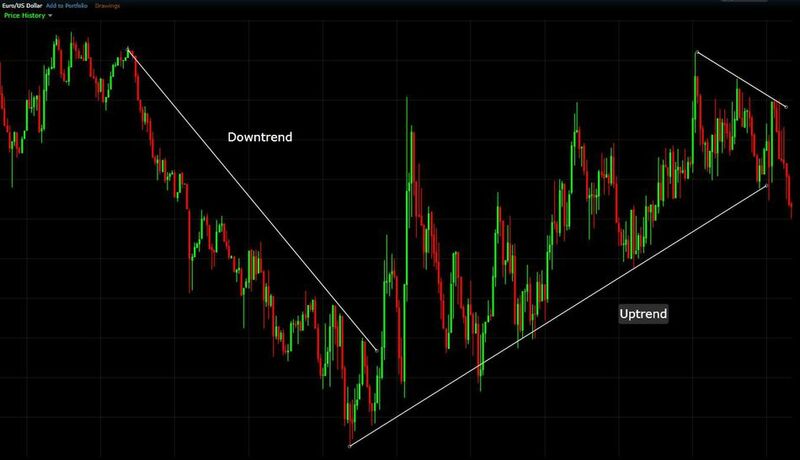 The following tips can help you effectively use trendlines as part of your trading strategy. Trendlines highlight a trend or range (sideways movement). A trendline connects swing lows, where the low is lower than the surrounding prices, and swing highs in price. When the price rises, the swing lows rise. Connecting these lows with a line results in an ascending trendline, showing you that the trend is up. A trendline can also be drawn along the swing highs. This shows the angle of ascent, and the strength of the price move, whether strongly higher or not. When the price falls, the swing highs fall. Connecting these highs with a line results in a descending trendline, illustrating the downward trend. A trendline can also be drawn along the swing lows. This shows the angle of descent​ and the strength of the downward price movement. Typically, you would have more than just one trendline in play. At any given moment you could draw many trendlines, all showing the price movement over various periods of time. Trendlines at very steep angles typically have a short life, since prices cannot sustain a near vertical rise or fall for long. That said, drawing trendlines whenever possible can aid new traders in spotting the overall trend, while also highlighting small trends and corrections within that overall trend. During an uptrend, buying opportunities may occur when a short-term downtrend meets the overall ascending trendline. During a downtrend, selling or shorting opportunities may occur when a short-term uptrend meets the overall descending trendline. Once drawn, trendlines often need to be adjusted. Prices don't usually move in a uniform fashion, and since trendlines account for both time and price, they move along the price and time axis. So any acceleration or deceleration of the trend requires adjustments to the trendline. Trendlines work as a tool, and can't be relied on solely. To decide whether a trendline should be adjusted, or whether it has been definitely broken, consider how the price moves within a trend. During an uptrend, the price makes higher highs and higher lows. As long as that keeps occurring, if the price moves below the trendline it doesn't necessarily mean the trend has ended, the line may just need to be adjusted. During a downtrend, the price makes lower lows and lower highs. As long as that happens, if the price moves above the descending trendline it doesn't necessarily mean the trend has ended, the trendline may just need to be adjusted. The need for constant adjusting makes a trendline imprecise for use as a trade signal. Also, consider that a trendline drawn at a slightly different angle can make a big difference on what price that trendline intersects with. Therefore, while you can use trendlines as a guide, use more precise criteria for entering a trade, such as a move back in the trending direction, an engulfing pattern, or an indicator which adjusts more precisely and quickly to changes in volatility. If you use trendlines as just a guide, then you don't need to concern yourself with drawing trendlines along exact highs or lows. Draw "trendlines of best fit." The best fit trendlines still provide you with a visual trend and alert you to potential trade areas. In some cases drawing trendlines along extreme highs and lows works, but when it doesn't, draw trendlines of best fit. Since the trendline isn't being used as a trade signal, it still provides you with relevant information about the trend, without the need to constantly readjust it. Trendlines are a great tool, showcasing short-term trends within the overall trend. Pay attention to price action and always consider it when using trendlines. If the price makes lower lows and lower highs, it's still a downtrend even if the price moves above a descending trendline. If the price makes higher highs and higher lows, the price still has an uptrend even if it moves below the trendline. A trendline needs to be adjusted, often, especially when day trading. Use "trendlines of best fit" to avoid constantly adjusting. The trendline of best fit still shows the trend and when the trend may be reversing. Use trendlines to alert you of potential trade opportunities, and use price action signals to get in.